A week ago today when we were at a very special wedding. 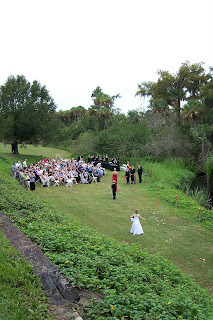 The daughter of our best friends tied the knot in a beautiful (though HUMID) outdoor ceremony in Florida. We've watched Veronica grow up - Brian since she was a teeny baby - me since she was 4 and lived next door to us. She was 7 years old at our wedding nearly 17 1/2 years ago. And now she's MARRIED! But, she couldn't have picked a nicer guy than Berkley - he's a keeper for sure. We made the 1,300 mile trip in 22 hours - almost to the minute. We couldn't have taken another piece of paper with us - we were packed to the gills in our Honda Odyssey. The kids were wonderful the entire drive - didn't have to pull over and beat them once, or even swing blindly at the back seats. Praise the Lord for books on tape and in-car DVD players! 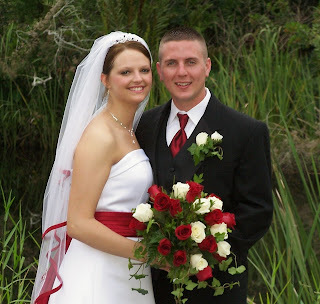 Veronica was a radiant bride in a very simple pure white gown set off with a dramatic deep red sash. 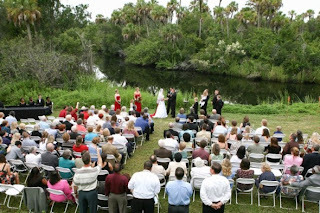 Her attendants wore the same red, that normally wouldn't have been anything special - but set against the lush green surroundings of the bankside ceremony it was strikingly beautiful. Over the years she's proven herself and has quickly moved "up the ladder" at her job. She was promoted (again), shortly before the wedding, to assistant store manager at Publix. This left her with precious little time after working 50 hours a week (some really odd hours sometimes) in which to pull a wedding together. But she knew what she wanted and had a plan on paper and (with a little physical help) managed to pull it all together in the last couple of weeks before. One detail she hadn't really covered was the wedding program, so I took that on for her. 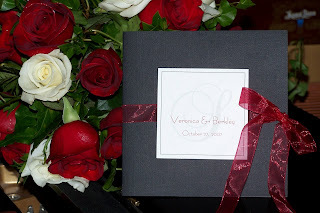 Thankfully, her dad was there with his laptop and expertise and we spent many hours researching wedding program etiquette, finding and downloading fonts that matched what we'd used on the invitations, and hammering out the details. Ronni wanted it simple and suggested it be done as a third of an 11 x 8 1/2 piece of cardstock, but everything didn't fit well enough - or at least fit at a font size that was readable by the naked eye. Also - with the "S" monogram at the top and all the names underneath it looked like a fancy perfume bottle when you held it out. So after some tweaking and purchasing a few more supplies, this little book style program is what I came up with. With a team effort we got 160 of them assembled in the last couple of days before the wedding, (last bow tied at about 6 a.m. the morning of...) It was funny to stand up on the hill above the guests and see all the little programs flapping back and forth - they were great little fans! Here are the guts of the little books and a photo of Chris taken by Lucinda. Chris stepped in a tended the programs and many, many other things. She and her husband, Mark, really worked hard on the details for Ronni and Berkley. 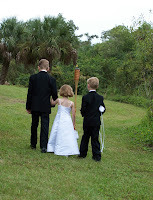 All three of our kids were part of the ceremony. It was very special - Ronni held each one of them when they were just hours old, she's baby-sit on them, fed them and changed all their diapers - even the stinky ones! She holds a special place in each of their hearts. 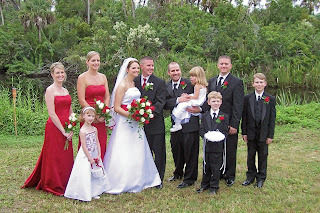 Michaela was flower girl, Jacob, ring bearer and Zachary, Junior Groomsman. (He felt quite grown up hangin' out with the big guys...) It was a very long "aisle" to walk down - I'd say it was nearly the length of a football field. The photo above shows my vantage point from up on the hill on the "bride's side" where I was giving cues. The men came in from the opposite side to the right of that large tree and in front of the chime choir (which played beautifully). Because the ceremony site was so narrow, they processed across the front - it was very unique and a nice break from tradition. By the time I cued Ronni and her Dad in I was able to run around and take a seat with my hubby. You can see us below on the outside end of the second row - we're wearing red :0) It was a little weird to sit "alone", but all our kids were up front trying not to catch our eyes... 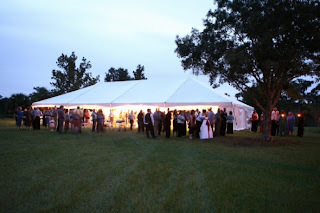 The photo directly below and the one a little further down of the reception tent were both taken by their professional photographer, Chad, of CMS Photography out of Sarasota. The kids performed their tasks very well and aside from 1) Michaela banging on the bottom of her basket (to be sure it was empty) once she arrived on her mark, 2) Jacob lifting the pillow up and down during the ceremony by opening his arms wide while holding the ends of the ribbons, and 3) Zachary being on the roof (observation deck really) of the house when they called for the bridal party to enter the reception, I have no complaints. Unless I'm allowed to complain that I didn't get to visit nearly enough - I missed talking with many old friends and didn't sufficiently catch up! Since we were staying in the "un-sold" and empty home of our friends, I needed to haul quite a bit along just for general living for the week we were there - like a small TV and DVD player, air mattresses, pillows and blankets, and kitchen supplies. It was basically air-conditioned camping. Fortunately, our friend Susan was able to loan us a folding dining table and linens. So I had room in the van to take a major stash of scrapping supplies and tools (including a 2 x 4 foot folding table.) 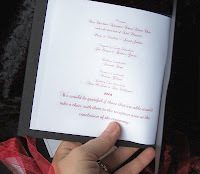 I was able to do several last minute wedding paper-crafty tasks, which I thoroughly enjoyed. 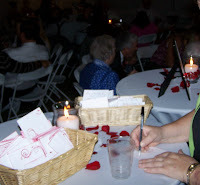 One of the unique ideas that Ronni came up with was to do away with the traditional guest book. 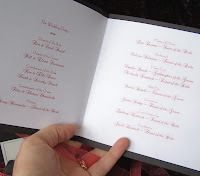 Instead she wanted individual photos of the wedding guests and to have them sign a small card with their names and whatever sentiment or advice they'd like to give. 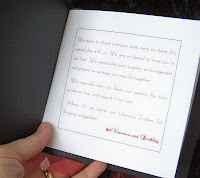 This way, later she can scrapbook the guests photos and their card together. There were a lot of paper scraps left over when we made her wedding invitations last spring. 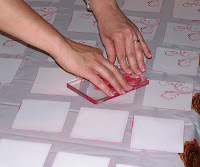 That's what she planned to use for the cards - in several different sizes to give the guests creative options. She had me ink the edges for her and with her permission, I stamped several different swirly designs with my acrylic stamps. 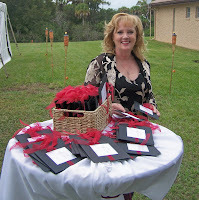 There were HUNDREDS of cards and my fingers had red ink on them for a day or so - but they looked nice in the basket at the reception. Maybe she can use some of the extras for journaling blocks in her scrapbook. Lucinda took the photo on the left of Marcia signing the guest cards. I also made some time to put together this quick 6x6 inch card and cover this paintcan to wrap our gift of "first Christmas" ornaments. 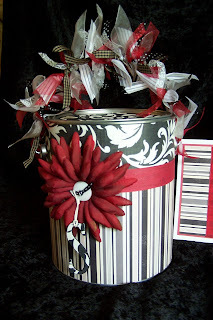 I think the paper is Foofala, some of the ribbon is Making Memories and May Arts, there are red Stickles accenting the stamped swirl on the card, but I can't begin to say what the other supplies were. EXCEPT for my adhesive in that mondo roll from 3M - that stuff holds like nobody's business! Even on the metal. Can't recommend it enough - though I did eat through an entire roll of it putting together the wedding programs. But at $2.99 for 36 yards I can't complain about that either.